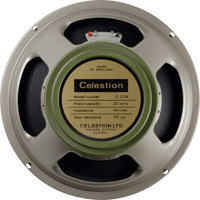 The original G12M of the 1960s was Celestion’s first guitar speaker to use a ceramic magnet and paved the way for high power guitar amplifiers. The G12M uses a medium weight magnet to produce a sound that is smooth and warm but bright enough to hold its own against any rock backline.Known simply these days as the ‘Greenback’, the G12M’s fabled ‘brown tone’ is characterised by a warm, controlled low-end, a rich, vocal mid-range and a delicate, detailed top-end. Loaded into a 4×12 and driven hard, these speakers exude warm, crunchy chords and sweet searing single-notes.